•	Somewhere in between the two! Throw drugs, explosives and a myriad of modern ways crime is committed today and you end up with a range so diverse that the modern GSD finds difficult to breach. It is traditional to choose canines bred as working dogs as PSDs, which has created a huge demand for GSDs, Malinois, and Dutch Shepherd varieties from countries, like Holland, Germany, and Belgium. Unfortunately, the increased demand has in no way increased production of serviceable German Shepherds. Plummeting numbers of GSDs as PSDs tell the story all too well! •	The GSDs are now primarily being bred for the show ring with not much attention given to presence of working traits in the breeding stock. •	Sport’s failure in weeding out the less desirable characters from the gene pool. lack of fighting instinct, absence of play drive evaluation, or Schh scores used to qualify a breeding candidate. 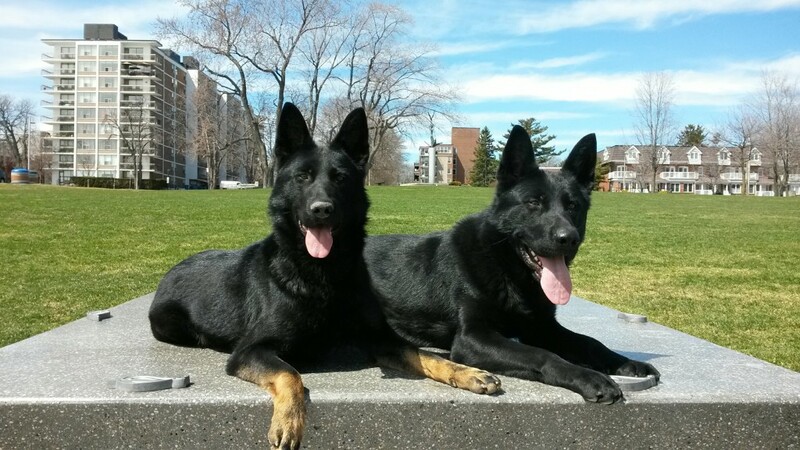 •	Few individual GSDs now have sufficient drive that enables them to excel at duties of a PSD. •	Additionally, diverse environments and a variety of tasks now involved with PSDs has made things complicated. We expect the PSD to work with SWAT Teams. In such cases, small security deficiencies, minute changes in sound sensitivity, as well as, the changing nervous threshold can lead to huge prices being paid. Society, today, demands the PSD be controlled and the handler — and other concerned parties — be safe while in pursuit of armed/violent suspects on the run from the law. This had led to increased demands made over the temperament of the PSDs, as well. A controllable canine is the result of more than just training, it also requires the animal in question to be tough and brave, — all of which used to be synonymous with the GSD in the past. Scent training now incorporates areas, which had not been required of a GSD previously. •	Learning to differentiate between the suburbs and urban areas is one such area. The GSDs must be able to search uneven terrains, as well as, maneuver through crowded areas and be able to pick a scent from the multitude of smells in such areas. •	Other new things to learn for the GSDs were sniffing out drugs — storage, import or even distribution —, body dumpsites, suspected arson etc. •	Recreational areas in the wilderness have also added to the load of the GSDs since people who take off to these areas often require rescuing. •	Worldwide threats — whether precipitated by natural disasters or terrorist attacks have further extended the list of things to learn. However, scent work through training has not yet been standardized. Producing a progeny trained in this type of work is thus difficult. I have heard that the German Police has considered addition of retrieval exercises to the Korung for breeding candidates; however, a corresponding test has yet to be added by the SV. Such a test would have a wide range of applications. •	Follow the German Police, Northrhine-Westfalia’s lead. Development of breeding programs for both GSD, as well as, the unregistered Malinois dogs from out of Holland. With the common aim i.e. provision of well-bred and healthy PSDs, the state now breeds the lion’s share of PSDs currently in use. In the U.S., though the local law enforcement relies too much on the products of imports or the result of hobby breeders. •	Max V. Stephanitz introduced the GSD only because of its working ability. Candidates chosen to be included into the ranks of PSDs should be strictly checked. Animals that do not meet the mark should be rejected, even if that means all the GSDs are declared unfit for the job! However, their pièce de résistance has always been their excellence in the police canine arena. Other breeds traditionally used to herd cattle may be much better at their job than the GSD but nobody beats them at police work. With demands of appealing physical appearance flooding in, the entire picture could change! Law enforcement might give up on GSDs entirely, turning them into lapdogs for the wealthy and eccentric which is entirely against the German Shepherd Dogs nature.